The BLCS-2 is a coverstitch/chain stitch machine that enables sewers to achieve a commercial finish on all dressmaking and home decor projects. The BLCS effortlessly creates triple, wide and narrow coverstitch as well as chain stitch. It offers professional finish on hem, belt loops, bindings and much more. The BLCS-2 offers exclusive Baby Lock features such as Jet Air Threading, tubular looper system, full featured differential feed and the ability to chain off for ease of use. The chain off feature can also be used with decorative threads to create beautiful braids. These features are just some of the many patented features exclusive to Baby Lock. 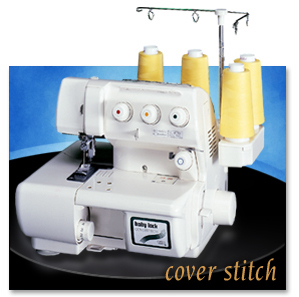 The BLCS Coverstitch is the perfect partner to any overlocker or sewing machine.